Well well well, we're all moved in and although the new apartment is bigger, the layout creates some problems for storage. In our last apartment, we were very spoiled with things like an over-the-closet storage area and a giant hall closet which I can only compare to Monica's junk closet from Friends. I am actively researching more solutions and they will be coming in future posts! Look! 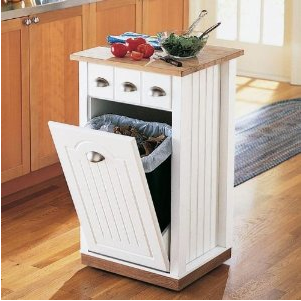 This little island fits a 13 gallon garbage can so snuggly! The only real deceiving part is the island includes only one drawer, not three. However, one big drawer is probably more convenient then three little ones though, so I'll let it go. The measurements are 18w x 18d x 35h and will fit perfectly in the corner of the kitchen. I suppose landlords figure if you can afford the rent, you can afford to supply your own counter spaces as well?? ?